I stood there, in front of the car, bleeding (but beginning to scab already) and covered in rash. Andrew looked at me and said, “Well, you got your adventure.” I couldn’t tell if he was pissed or if he just mocking me because he thought it was actually funny. He was wearing shorts and got it even worse than I did (I wore jeans). Poor Andrew. It all started when we drove out to Pittsboro, Indiana to see some friends’ new baby. I hate driving to Pittsboro. I just do. There’s always road construction on the interstate and it’s just kind of far. I have gotten very used to living downtown where nothing should take more than a 15 minute drive/bike/walk. We stayed at our friends’ for about an hour, looked at the baby (cute and cuddly), held it some, ate pizza, and left. I realized soon afterward that we were in Hendricks County (in a genealogist’s world, everything is measured by counties and townships). Not only were we in Hendricks County, but we were in “middle of nowhere” Hendricks County. I recalled that some of Andrew’s great grandparents, maybe six generations back, were pioneers of the area I would refer to as “Middle of Nowhere Hendricks County” and had a cemetery around here somewhere. “Hey! I’ve got an idea! Let’s have an adventure!” I described my idea to Andrew to hunt for this cemetery so I could get some pictures. It shouldn’t be that hard. We were both armed with iPhones – the cure-all. Andrew didn’t hate the idea but he didn’t seem all that excited. We decided to go for it. He knew I was pumped. We drove from our friends’ home (near the middle of nowhere) down a county road, turned onto another county road, and then another, and then another, until we were sufficiently truly in the middle of nowhere. The directions provided to us on www.findagrave.com (yes, this is a real thing) told us to park off the road and walk along a fence to a patch of woods in the field. What provided us the adventure was that, this was not a walkable field. It was a field of corn. This was Indiana. This was late July. It was 2 feet taller than me because it has been a really nice summer for crops. We walked through a fence. Check! I saw some trees. Check! We walked through some corn and got to the trees. Check! It took about three minutes. Easy! When we got to the trees we saw the ACTUAL fence. This was the ACTUAL fence we were supposed to cross. So what was that first fence? This new fence was a rusty barbed wire one. I couldn’t tell you the last time I’d had a Tetanus shot, but I was trying really hard to recall as I looked at that fence. I pulled myself up by a tree that I am sure now was dying. If Andrew had not been pushing me from behind I can guarantee that limb would not have held and I would have cried all the way to the hospital. We both got over. We got out of that batch of woods to get our bearings. Andrew pulled out the trusty iPhone and pulled up a Google Map of where we were. And he said, “OH! That’s the stand of trees over there!” The stand of trees was on the other side of another cornfield. For those who have not walked through a cornfield before, it hurts. It looks like fun in the movies. It’s not. It hurts. And if you’re hitting it hard enough, it even cuts. We had gotten this far, we weren’t going to stop. I wanted to see that cemetery! And I was going to take pictures, darn it! We pressed on. This is when we started hearing the engines of what we agreed were 4-wheelers. This was, of course, private property. The house we parked at was the home of a lovely woman who said she didn’t really know where the cemetery was, but to go ahead and try to find it. She, however, did not own the property. I had already decided that if some man dressed in his cammies came at me with a gun and a lecture on trespassing I would just blame the lovely woman who owned the house where we parked. Regardless, the 4-wheelers started to freak me out. We FINALLY got to the stand of trees in the middle of the cornfield. Once we got there we couldn’t get into it! It was as if the plants had spent their entire existence learning new ways to defend themselves from huge predators. Every plant had a sticker or a spike attached to it, even the trees! There were pointy dangerous things EVERYWHERE. We finally found what must have been the official entrance some time ago. There was a very small piece of a wrought iron fence, being eaten by trees and plant-life of course. 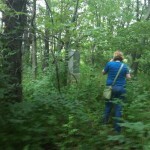 We pushed in through that area and actually saw some flippin’ graves! Unfortunately the person who owns the property has done nothing to keep up this cemetery, an amazing piece of Hendricks County history. The Caywood family (some of Andrew’s great great great great grandparents) settled in that area in the 1840s. There were some of those large casket-like above ground tombs that seem to have completely fallen over. 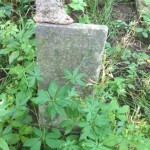 Trees grew into headstones. There were really only 2 stones that still stood and were readable (with the amount of foliage that existed this time of year). Pity. We poked around for a bit, took a few pictures, and headed out back into the field. During the walk back to the house I somehow decided that the noises I was hearing were no longer that of a 4-wheeler but of a wild and crazed bull, and it could smell us and our illegal trespassing. I walked very very fast, and thought that I lost Andrew for a minute, but we got back to the place where the greenery was shorter than us again. It was nice. My skin stung. Everything was red.